Get your Selfie Sticks for Carnival – take the ultimate photos of you and your friends playing mas, at the fetes or even at the beach. It’s the perfect gift for birthdays, or just for so. And it’s now on SUPER SPECIAL too. 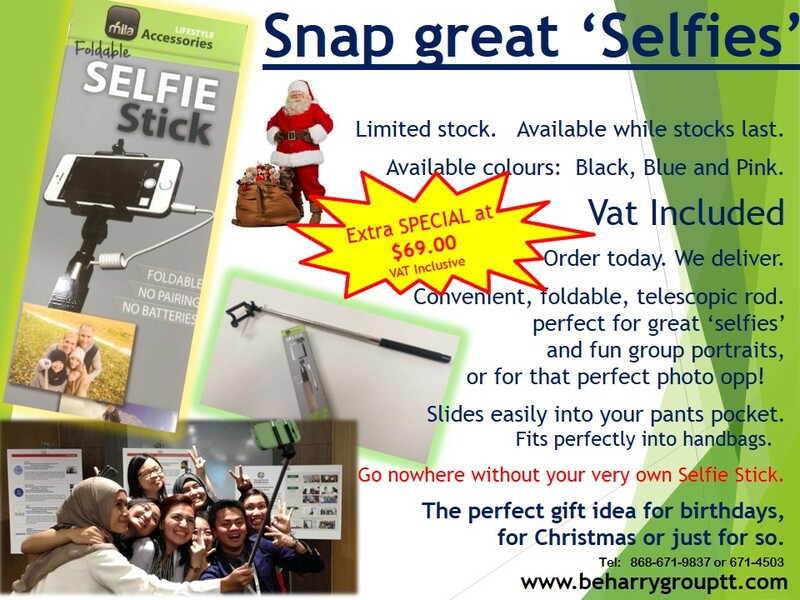 Convenient, foldable, telescopic rod – perfect for those great ‘selfies’ and fun group portraits, or for that perfect photo opp! Slides easily into your pants pocket. Fits perfectly into handbags. Go nowhere without your selfie stick. Get yours today! Call 868-671-9837 or 671-4503 or email us at [email protected] We’ll deliver to. Compatible with IPhone models using IOS 5.1 or later and devices running Android 4.0 or later. Some earlier versions may need camera settings adjusted or use free alternative camera apps (eg. Camera 360 App) or can use camera timer settings.